Spokane's own coffee star will give the other "Starring-Bucks" a run for their coffee money! 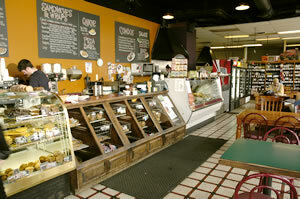 This locally owned coffee/bakery has 8 locations with 3 of them conveniently located downtown. The Rocket Bakery makes their own bakery creations, bagels, tasty sandwiches and soups. They take the cake again and again as a local favorite and you can take the cake, the scones, the banana bread, the cookies or the muffins! Each location offers its own ambience to make you feel like it's a neighborhood shop you can call your own. 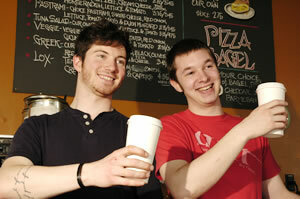 The friendly staff make you feel welcome in the neighborhood and each is skilled in brewing the perfect cup of Joe. Howard St is in the Holly Mason tech center and features alleyway outdoor seating and tech conversation opportunities. Spokane is a coffee sippin city, join us! home of the famous pink cookie mentioned on blogs nationwide! !